Goodreads says, "Twenty-five year old Ivy Rowan rises from her bed after being struck by the flu, only to discover the world has been torn apart in just a few short days. But Ivy’s life-long gift—or curse—remains. For she sees the uninvited ones—ghosts of loved ones who appear to her, unasked, unwelcomed, for they always herald impending death. On that October evening in 1918 she sees the spirit of her grandmother, rocking in her mother’s chair. An hour later, she learns her younger brother and father have killed a young German out of retaliation for the death of Ivy’s older brother Billy in the Great War. Horrified, she leaves home, to discover the flu has caused utter panic and the rules governing society have broken down. Ivy is drawn into this new world of jazz, passion, and freedom, where people live for the day, because they could be stricken by nightfall. But as her ‘uninvited guests’ begin to appear to her more often, she knows her life will be torn apart once more, but Ivy has no inkling of the other-worldly revelations about to unfold." Buchanon, Illinois is a quiet town, but it's filled with people who hate Germans, thanks to World War I. Plus, this small town is dealing with a dangerous strand of influenza. Ivy Rowan, a twenty-five year old piano teacher, just recovered from the flu and has come to find that her brother and her father confess to killing a German. Just because. Ivy is disgusted by their blatant racism and violent acts, so she finally gains the courage to leave her family's house. She heads into town to find a room and comes across May, a recent war widow, and May takes Ivy in. But you see, Ivy isn't a regular girl. Many of the women in her family can see ghosts, so keep this in mind. While in town, Ivy feels compelled by guilt to seek out the brother of the man her family killed, hoping to help him out in some way. Even though at first their relationship isn't a strong one, they can't deny their attraction to one another. As their relationship progresses, Daniel, the grieving brother, introduces Ivy to jazz as well as love, but he is hiding a secret. To top it off, the American Protection League (sort of like a racist town watch) is on to Ivy and doesn't take well to her hanging out with a German. Plus, Ivy sees more and more ghosts. What can it all mean? Cat Winters's first adult novel, The Uninvited, left me feeling rather unsatisfied. Although I enjoyed the setting, many parts of the story fell flat for me. 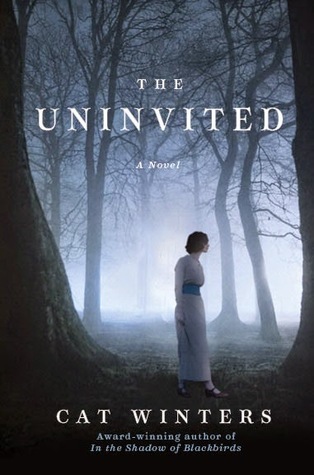 Ivy is an interesting character, but I couldn't get to know her in The Uninvited. I had a hard time relating to her and quite frankly, I was surprised she was twenty-five. This is where my struggle with the book begins. Initially, I thought this was a young adult novel, so I had a hard time wrapping my head around Ivy as an adult. Nonetheless, I did feel for her as her family is awful and I wanted her to leave them and finally start her life. Her relationship with Daniel didn't work for me in The Uninvited. At first he kept pushing her away and then all of a sudden, they ended up together and I was thinking, "Wait. What?" There's definitely tension between them, but I just wasn't feeling the slow burn. I did like how Ivy helps two women working for the Red Cross. Ivy drives the ambulance around and they help the victims of the flu. I appreciated her desire to do more and be more than she was before as she was practically a hermit and never left her parent's house. There is a paranormal element in The Uninvited, but I can't say it really worked for me despite the potential. However, I will admit the plot twist is an interesting one and kept me reading! I think I am going to stick to Cat Winters's young adult novels in the future, because The Uninvited ended up being a middle of the road sort of book for me. Cat Winters is proficient in this era. I also love the hunting elements thrown in. Definitely one to add to my list this week. I know!!! I loved The Cure for Dreaming, so I had high hopes for this one, but ultimately, I didn't like the MC. I hope you like this book a bit more than me. I can't wait to hear your thoughts. Thanks for visiting, Joy! The description sounded really good, Christina; thanks for letting us know what you thought of it. They can't all be great, right? :) Hope your Monday is going well! You are so right, Tara! Thanks for visiting! Too bad it's not as good as you'd hope! I like the cover and the synopsis is so good. I'll take a look at her YA books. Great review! I really liked her YA book a lot better and I hear her Blackbirds novel is awesome, so I think I am going to stick with her YA novels. Thanks for visiting! I thought this was a YA book! I hope I didn't purchase it for my library's teen fiction collection! Oops! Too bad this didn't live up to expectations. The premise certainly sounded promising. Have you read Delia's Shadow by Jaime Lee Moyer? It is set around the same time and also deals with ghosts. I'm glad you also were confused about this. I know the synopsis says that the MC is older, but for some reason, I convinced myself that this was a YA novel! I haven't read Delia's Shadow, but I know how much you enjoyed it. I will definitely add it to my TBR list. Thanks for visiting, Christina!